You don’t have to be a great cook of fancy food in order to have people over for a meal…trust me, I’ve been doing it for years! Even though I don’t love cooking like some people do, I have always been committed to the family dinner because it works like glue in our lives. There’s something about breaking bread and sipping wine and enjoying conversation with family, friends, or colleagues that is more than the sum total of its various parts. Whatever age your children are, whatever your home looks like, whatever you can or can’t cook (Uber eats? ), being committed to at least one meal together everyday as a household and having guests often, will bring tremendous blessing to your life. Hospitality in my mind has always been about being welcoming and real and being ‘present over perfect’ which also happens to be the title of Niequist’s next book (Present Over Perfect: Leaving Behind Frantic for a Simpler, More Soulful Way of Living). I think I will read it but the title is almost enough already. Shauna Niequist brings a down-to-earth perspective in her book Bread and Wine. She makes herself vulnerable with the funny and honest stories she tells about her own life with themes of hospitality, spirituality, community, food, friends, family, infertility, love, and shame, AND there is a recipe included at the end of every chapter! I loved this book and read it slowly, trying out her comforting and easy recipes along the way, many of which have already become favourites and are simple enough to memorize and/or tweak to your own tastes. Pull up a chair, pour yourself a glass of wine, and enjoy the conversation at Niequist’s table! Wondering what to do with all those Chapters gift cards you got for Christmas? Now that the Christmas cookie crumbs have been swept away, put this book on your coffee table instead. After studying it, you’ll never eat another meal or visit the grocery store in the same way again. 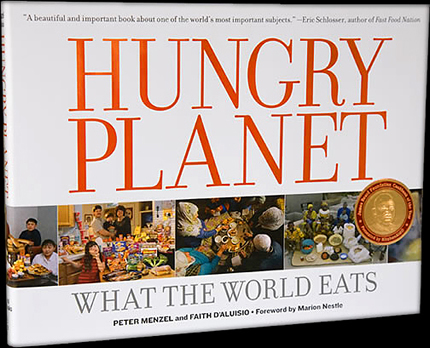 The sub-title of this book is ‘What the World Eats’ and that’s exactly what it shows you. Mostly in pictures and statistics, but with some writing, what is presented is how 30 families from 24 different countries eat and how much it costs them. Contrast the amounts spent on food for a week in Africa & Asia, compared to Europe and North America. What about processed foods, bottled drinks, fruits, meats, and vegetables? The photographs make us pay attention and draw us in, and the questions the photos ask, engage us even more. This husband and wife team have done an amazing job teaching us about our global diet. Now there is some food for thought!